Everise has announced that they will be giving out free MILO at their Everise store for their Facebook friends. The announcement was made over their official Facebook page. According to the announcement, the free Milo sachets are free without purchase. However, one will need to flash the coupon below on their phone, or print it out for redemption. 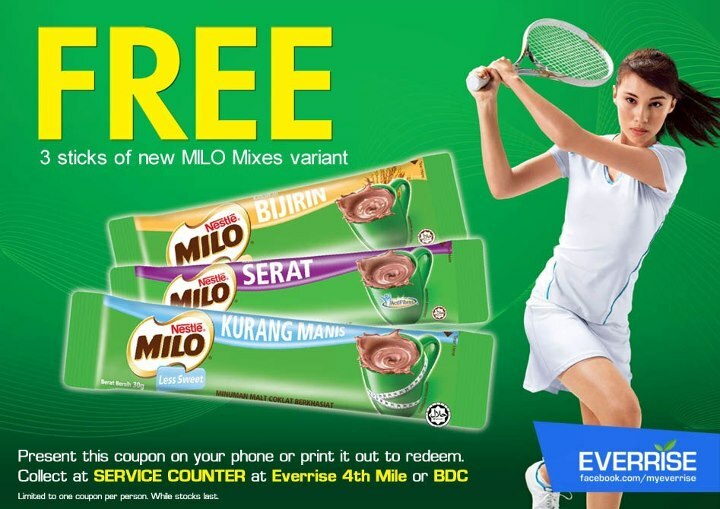 The statement further added that collection of the MILO sachets can be made the Service Counter at Everrise 4th Mile or Everrise BDC and is limited to one coupon per person. Each coupon entitles a total of 3 sticks of the new MILO variants. The offer is valid from 12 AUG 2012 (SUN) onwards and while stocks last.